... vertelde ze haar vriendinnen in de trein van Utrecht naar Den Bosch, maandagavond, terwijl aan de andere kant van het gangpad twee dronken corps-ballen een parodie van zichzelf zaten te wezen. Alternatively titled: My atheist husband is no longer a Sunni. When we got married in Cyprus, our papers said ‘Walid, Lebanese Sunni’ and ‘Nicolien, Dutch None’. Because the Cypriots take all the information from the official documents, and Lebanese official documents automatically state a person’s sect (whether they are religious believers or not is irrelevant), my poor atheist husband will forever have a marriage certificate that classifies him as a Sunni. Unless we get married again, because then his papers will say ‘Walid, Lebanese /’: yesterday, he officially removed his sect from his papers. He will no longer be forced to identify as something he doesn’t believe in, that his father didn’t even believe in, passed on to him along paternal lines just because the Lebanese State refuses to make a civil law for things that can also be arranged by religious decrees. Until recently, it was impossible to have any papers that did not state one’s sect/religion, until the former Minister of Interior Ziad Baroud decided that it was permitted to have it taken off (and replaced by a “/” sign). This despite the legal problems that will probably occur when the people who have removed their sect want to get married in Lebanon, or be buried in Lebanon, or other such personal matters which are up until now only arranged by religious institutions and then recognized by the State. The Minister didn’t have time to print official applications, but he made the required text available to all Mokhtars (a Mokhtar is the person you have to go to in Lebanon to identify yourself in order to do any and all governmental procedures – usually a guy with an office on a street-corner close to your house, or, as with one of my friends, in the back of a gas-station), thus opening up the possibility to keep one’s religion separate from the State. Jamil, a friend of ours, was the first to do it. Whether he believes or not, he doesn’t think religion has any place on official documents, so he went through the remarkably short procedure and had his sect removed – despite his mother’s fears that this was his first step on his way to becoming Shi’a (quite possibly her biggest nightmare). Because Walid’s Mokhtar didn’t want to participate in the procedure (giving excuse after excuse about the lack of official applications), he went to Jamil’s Mokhtar, who gladly obliged and wrote the required yada yada yada on a paper, cheered on by two men who were waiting and thought that everybody should have their sect removed. Not so in the Ministry of Interior. On his way to the office to get the last required signature and be forever de-sunni-fied, a friendly government worker tried to warn Walid of the dangers involved in carrying out this operation. ‘You will not be allowed to marry in a religious court!’ he pleaded, his hand on Walid’s arm. ‘I’m already married, in a civil ceremony’, was the answer. ‘But you won’t be able to be buried in a Muslim cemetery when you die!’ the distressed employee tried one more time, just before he opened the door. It couldn’t change Walid’s mind; he went in and had his paper signed. I’m proud to say that my husband is now officially a “/”. Sietske has a post up about the way things are celebrated in Lebanon: with fireworks. Beautiful fireworks, and dangerous gunfire: emptying one’s Kalashnikov (or recently: RPG) straight up into the air to celebrate (re-)election of one’s favorite politician is considered quite acceptable behavior by many. It’s one of those habits that’s amusing as long as you don’t think about the consequences, because as Sietske says: what goes up, must come down, and a bullet coming at you vertically is no less lethal than a bullet flying horizontally. Walid tells me the story of the first time Nabih Berri was elected Speaker of Parliament, in the early years after the civil war. Celebratory gunfire erupted in the neighborhood of his school. They were playing in the recreational area during the break when suddenly a boy fell to the floor, blood all over the place. He was rushed to the hospital and the bully of the class was punished because ‘he must have hit him with something sharp’. As it turned out later, a bullet coming down had entered the boy’s body close to his neck and had ended up close to his heart. A friend of mine told me a similar story. When the civil war was over, she and her sister went out to celebrate. So did many people – with their weapons. The sister was hit by a ‘celebratory bullet’ in her lower back and brought to the hospital; she’s still in a wheelchair. The most famous of these tragic stories is from a wedding in the Beqaa: when the newly married couple drove off in a convertible, their friends and family were shooting in the air to celebrate. One of the bullets came down and hit the bride; she died on the spot. 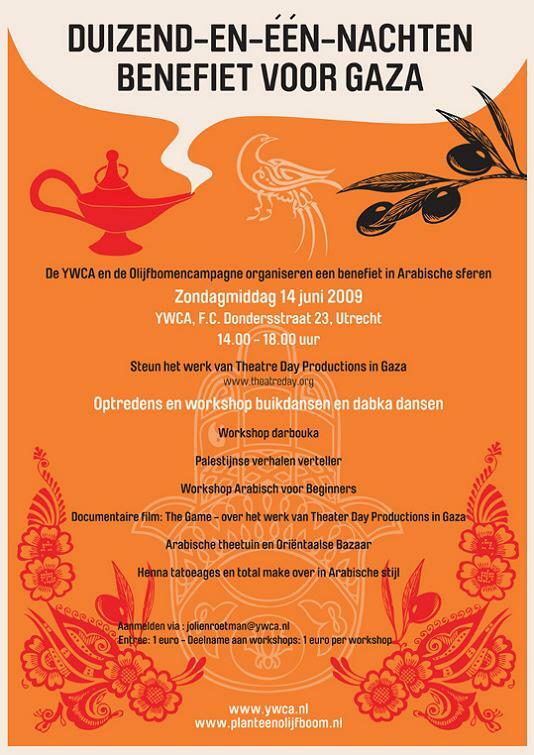 A.S. Zondag (14 Juni) van 14.00 tot 18.00u. in de F.C. Dondersstraat in Utrecht: een benefiet voor Gaza. Workshops, films, verhalen... genoeg te doen om er een kijkje te nemen. Ga en steun Gaza! A friend of mine works as a psycho-therapist with the people in Roumieh prison. A large part of them are serving time for drug-use, but there are also those who are convicted for much more severe crimes. He says it’s not always easy work, and sometimes he has to forget about all the psycho-analytical theories he has learned to be able to deal with the prisoners, but it does give him some good stories. For example when one of the prisoners came to him one day and asked: What did I do wrong? I didn’t insult religion, I didn’t lie, I didn’t steal… The guy insulted my mother so I killed him. Now why am I locked up with the criminals? Honestly, how can you answer this?